Immunogen: Synthetic peptide corresponding to aa 170-185 of human USP30. Formulation: Liquid. Crude serum containing 0.1% sodium azide. Use/Stability: Stable for at least 1 year after receipt when stored at -20°C. Scientific Background: USP30 (ubiquitin specific protease 30) is a 517 amino acid deubiquitinylating enzyme that localizes to the mitochondrion (embedded in the outer mitochondrial membrane). Depletion of USP30 expression by RNA interference induces elongated and interconnected mitochondria, without changing the expression levels of the key regulators for mitochondrial dynamics, suggesting a key role for USP30 in regulating mitochondrial morphology. USP30 has also been shown to be necessary for certain aspects of the hepatocyte growth factor (HGF)-dependent scattering response of epithelial cells, indicating that USP30 could be a potential target for therapeutic intervention to prevent metastasis. 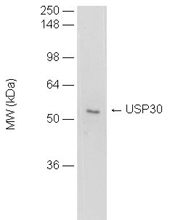 Figure: Detection of USP30 in human liver cell mitochondrial preparation (2.5µg) by Western blot using USP30 (human), pAb (Prod. No. BML-PW0975) (1:1’000).